For the making of my budding tarot deck, I’m logging a journal of progress notes to document my entire process. From June 13 to June 28, I shared my card by card drawings for the Majors, rough drafts, and pen and ink linework via Instagram. From June 29 to July 20, I completed the Minor Arcana cards. A listing of all posts about that are in the Progress Diary. That weekend of the 21st and 22nd, James and I decide to independently publish the tarot deck, so I got to work on researching what the heck that entails. Journal entries in the Progress Diary then evolved to commentary on the independent publishing process, working with a manufacturer, and the logistics of getting your deck and any companion guidebooks you’ve written in print. 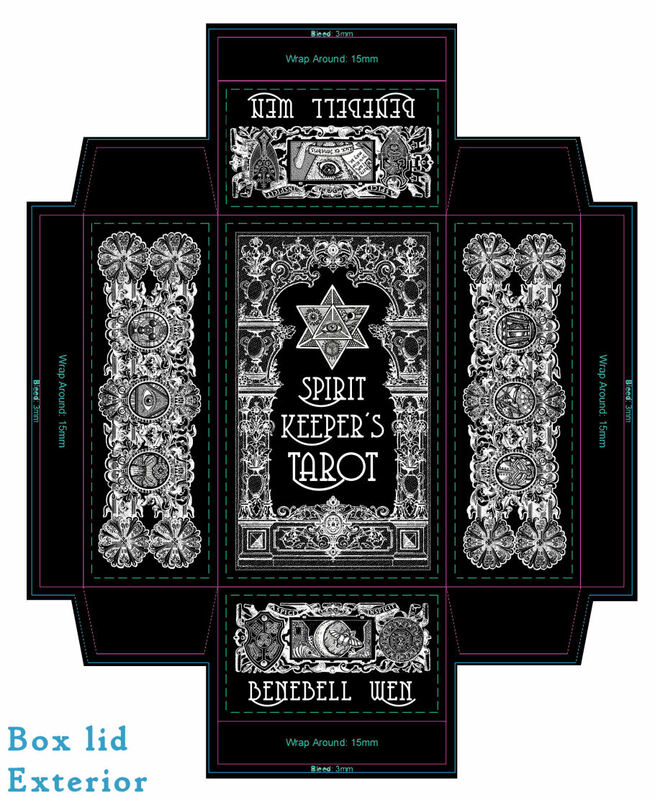 During the new moon in Leo and a partial solar eclipse, I finished the crafting of product packaging for Spirit Keeper’s Tarot. 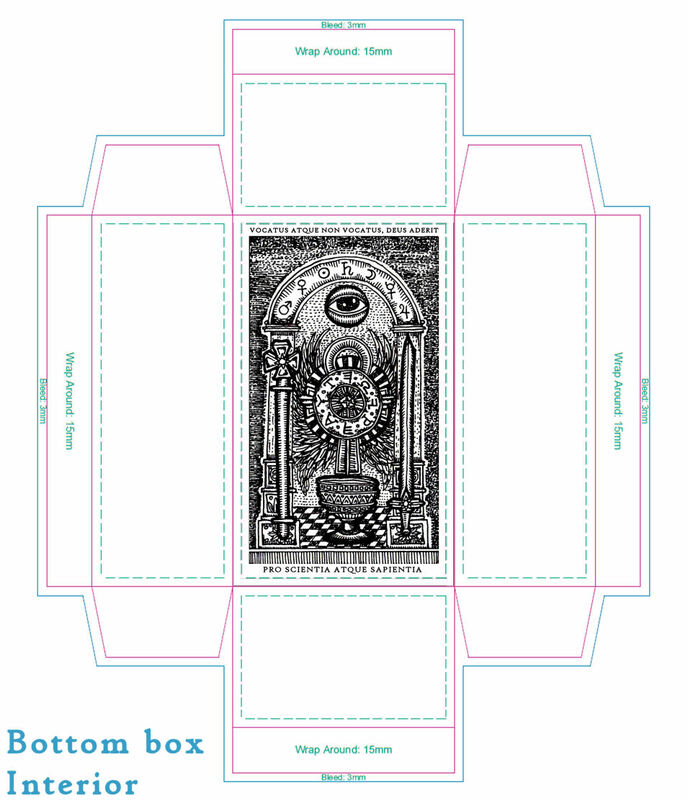 I spruced up some public domain decorative borders and old frontispieces ranging from the medieval era to Victorian and piecemealed them to fit with the specs and dimensions of my tarot box. I also merged them with clips of my own illustrations from the tarot deck. Thumbnails of (rejected) rough drafts that came prior to the final design I decided on. Typically on card boxes you’ll find a blown up image of one of the cards from the deck. I started with that concept, but it wasn’t feeling right. I also played with the idea of not even putting the deck name, author name, or any info at all on the deck packaging and just going really simple and discreet, like what you see in the above right. But for oh so many sales and business related reasons, that probably would not have been practical. So I kept tinkering with the design until I got to what you see here in this post. I love that interior side of the top lid to the box. It’s a classic motto from the Age of Enlightenment and it declares the spirit of the deck so well. The Victorian style decorative border comes from the frontispiece of an old public domain book, which I then had to spend a lot of time digitally cleaning up and also modifying so it fits my box dimensions. Then the center dove is my own drawing and design. 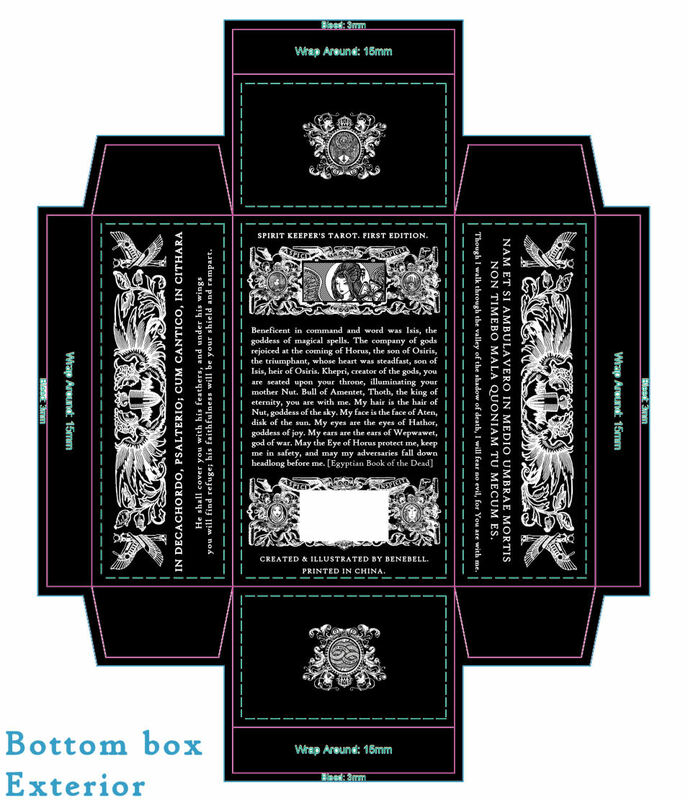 For newbie deck creators: when designing the box and packaging, first request the exact to-scale template from your manufacturer, and then create your design based off that template. Don’t just wing it yourself and then submit your own formatted files. I think here, following your manufacturer’s instructions is really important. Another issue I learned from experience, which I would like to share. So initially, the specs and template the manufacturer sent to me was 130 mm x 80 mm x 47 mm for the top lid (there are different specs for the top lid and bottom lid). 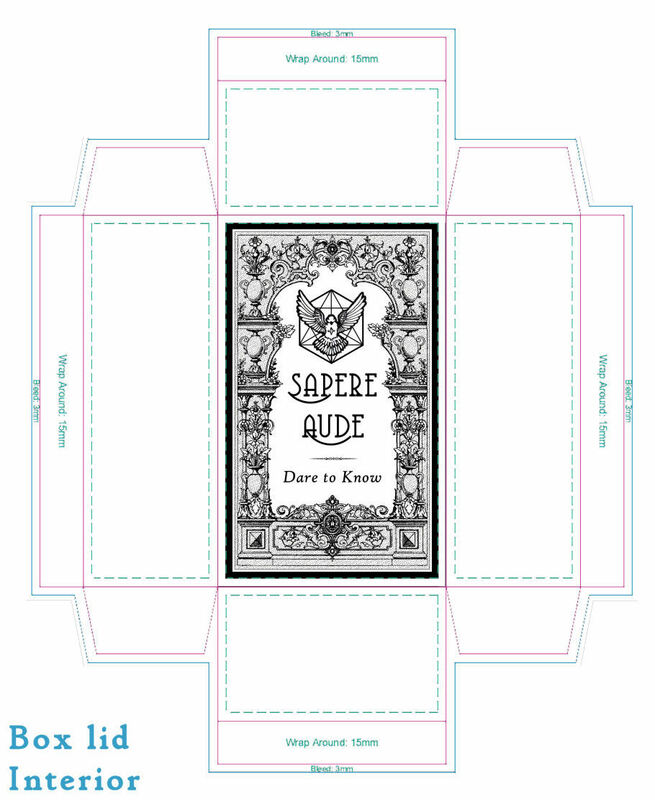 But then, just out of personal curiosity, I inquired back just for a confirmation: these dimensions will fit my 80-card deck with my cardstock thickness of choice, plus a 75-page tarot-card-size black and white booklet (the LWB), right? That’s when I got back the response that doh– nope. Actually, case specific to me, I need to go with 136 mm x 85 mm x 45 mm for the top lid. And something different for the bottom lid. So I had to re-do my design. I mean, the design layout stayed the same. I just had to reconfigure to the revised dimensions. The thing is. Had I not taken that extra step of initiating a double-check, we probably would have all gone right on ahead with the standard dimensions and only post-production, probably found out that not everything fits snugly or there are fit issues. The interesting thing is I’ve seen that issue in some of the indie decks I’ve purchased in the past, so kind of a light went on for me. Ohhhh… maybe this is what happened to them? So that’s why I’m sharing. You really are better off double-checking and verifying everything pre-production. If the manufacturer gives you specs, just reply back with, hey, I just want to verify that these specs will fit the exact specs of production for my specific deck, booklet, cardstock, etc. Now we get to the bottom portion of the box, which is where the cards would be stored in. So above is what you see for the back of the packaging and also the four walls. Oh– quick note– I made a design change to the final draft from what you see above. That’s because there’s a semicircle cut-out on the top lid for easy opening and closing of the box. since there’s that semicircle cut-out on the top lid, some of the walls length-wise of the bottom box would show through, so I didn’t want that part to be random text. I did a switch-a-roo of the text and decorative banner so that decorative banner showed through. Also, instead of writing a deck description or marketing copy about the product, I went in a different direction. I thought: what’s the point of the written text on the box of a tarot deck? It’s so you get a sense of the deck’s point of view, what the deck is, and what to expect from the deck’s style. I went with Biblical verses, psalms, and passages from the Egyptian Book of the Dead that, when I read it, bring me a sense of comfort. So that’s what went on the bottom box exterior. The feelings evoked from reading those particular passages, I hope, will be resonant with the feelings and spirit my tarot deck is intended to evoke. So ultimately, the text here still fits the purpose of marketing copy on deck packaging. I also reserved an ISBN number for my deck. I ordered my ISBN barcode for shy of $20 here. You don’t need to have your publication date, retail price, or even any other of the required information at the time of reserving your ISBN. You can do it first, then go back in later to complete and then submit the registration form. So that’s what I did, since I don’t know my release date just yet, or even retail price, since all of that is still based on unknown variables. Meanwhile, I reserved that blank white ISBN bar code patch on my bottom box exterior, which generally needs to be about 1″ x 1.88″, so that’s what mine is. To reduce import customs hassle, every single box should have the country of origin info on it, so that’s what I included as well. This box design, to me, is such irrefutable evidence that independent publishing is the right decision for me. I fussed and fussed over the details and the line work and the layout for this box for a far longer amount of time than any in-house hired contract designer would have fussed over it. I was exacting and demanding on myself in a way that would probably be insanely rude if I imposed the same on hired help. I also integrated ritualistic practices in sigil crafting with the graphic design, which again, is probably not something that would be practicable through a commercial publisher– I mean, right down to considering the numerology of pixels and spacing. I completed and then discarded over a dozen design drafts before I got to the one you’re seeing here. In traditional publishing, often the standard bar for product packaging is “good enough” and “marketable.” That just wouldn’t have sufficiently served the standard bar for me. Call me a snowflake or entitled, but I did not want Spirit Keeper’s Tarot to be just another list item for the season. So this weekend, as I Crafted the product packaging and design, I realized for myself how glad I am I went through the concerted effort of maintaining an Inviolable Innocence around all aspects of creation for Spirit Keeper. This came out beautiful! I agree for never settling for anything thats “good enough” think marketers should start catching on because lately I have been seeing amazing packaging designs. It was cool to find this because weirdly enough…the printer I’m using sent me your box and a few of your cards as a sample when I ordered card stock and box samples from China. So, obviously we are using the same printer. The tip about making sure the cards fit in the box is great. This is my second self-published deck but the first I’m doing in China which is a whole different experience. Previously I could have test copies ordered easily. Assuming your deck turned out great based on the box – congrats!